Introduction to Stand Up Paddle boarding and using an inflatable SUP. Since its humble roots in African, Peruvian, and Hawaiian cultures, "Hoe He'e Nalu", or surfing with a paddle dates back for over thousands of years long before surf legend Laird Hamilton popularized what he found to be a fantastic cross-training workout. Equipped with his largest surfboard and a canoe paddle he was mistakenly believed to have invented the sport although it was in fact the locals who were actually the first to surf waves with a paddle as an actual sport. Paddle boarding has quickly become one of the fastest growing water sports in the world because simply, you can do it anywhere! Any body of water, be it an ocean, lake, river or bay is the perfect environment for this amazing workout and fantastic new way to experience both the waters and outdoors regardless of age, or skill-level. Even the most inexperienced "Water-athlete" can be up and paddling around rather quickly. Many people think that you need waves to enjoy your inflatable SUP but this is simple not the case. inflatable paddle boarding is a fun, and relaxing way to enjoy the water with a minimum of gear. Inflatable SUP (SUP stands for Stand Up inflatable Paddle board) - This is the obvious first investment in your new hobby. There are a number of models to fit every users needs. Many beginners often start with shorter 9/10ft boards, never fully getting to experience the comfort and stability of a larger inflatable paddle board. For this reason we recommend that both beginners and novice alike consider at least an 11ft Stand Up inflatable paddle board. We here at BoatsToGo.com are very fond of the Saturn SOT365 12 foot Inflatable Stand Up inflatable paddle board. It offers a wide-array of features along with incredible construction and quality for a price that is half of what comprisable models are listed at. SUP Paddle - You should look for a paddle that's roughly 6" to 8" taller than you are, but ideally what fits you best and feels most comfortable is what you should equip yourself with. Stand Up Paddles are available in a variety of construction materials, along with handle, blade, and shaft designs/shapes. Size your paddle on the longer side for flat water use and the shorter side for use in the surf. The paddle you will use with your inflatable SUP should have an angle or “elbow" in the shaft for maximum efficiency. The blade is typically bent at a slight angle to the shaft to allow for more forward reach when taking a stroke. PFD (Personal Flotation Device) - Last but not least, you are going to need a personal flotation device wile using your inflatable SUP. The U.S. Coast Guard classifies stand up inflatable paddle boards as vessels, so always be sure that you are wearing an acceptable PFD whenever you're paddling out in open waters. We recommend a lightweight, inflatable PFD found at many local and online retailers. To get started first you will need to get your board to the water. Most inflatable SUPs, especially the Saturn SOT365 come with a handle built onto the top side of the board. To start, lean your inflatable paddle board to the side and rest it on its edge, or "rail" - reach towards the middle of the traction pad where you would stand and you should find a handle located in the center. Grab ahold and stand up, extending your legs and tucking the board up underneath one arm. You may use your free hand to carry your paddle or any gear you may have with you. This is the most comfortable way to carry your inflatable paddle board short/close distances. If you have to go a ways, perhaps after a river-adventure, or you purchased a model that didn't already come equipped with a handle than you should learn to carry the inflatable paddle board on your head. To do this, you must first stand the board on its end, or tail with the deck facing you. The deck, is the part in which you stand, in this case, where your handle is, or should have been. Note: Be sure that your paddle is within close reach for one get going! Grab each edge of the board and walk towards it, meanwhile bending down and placing your hands on the deck approximately half-way down between the nose and end of the board. Stand up, while leaning back slightly so the board may come to rest overhead, bend down and grab your paddle! That is all there is to it! While you are first getting used to inflatable paddle boarding it is recommended that you find some calm, flat water that is free of any obstacles, boats, buoys, or anything that may interfere with your experience. You may also find it easier if you begin while kneeling on the board opposed to standing upright as you gain balance upon your board. To start, stand alongside your inflatable paddle board about waist deep in calm water. Be sure that the fins and underside of your inflatable paddle board are free from coming into contact with any rocks. Lay your paddle across the top of the board, resting the grip along the edge of the inflatable SUP while the blade remains resting on the water. Use one hand to grab ahold of both the grip and the rail/edge of the inflatable paddle board and pop yourself atop the center of the board in a kneeling position. You should have uniform weight displacement across the board and the nose and tail should be evenly balanced across the surface of the water. If you find either end digging in re-position yourself while maintain hold of both sides of the board. As you get comfortable with the balance of the board, you may stand up one foot at a time, placing your feet where your knees had been. Feel free to make use of a friend or fellow inflatable paddle boarder while getting accustomed to this part! Now that you have gotten comfortable balancing the inflatable paddle board about in calm, flat water you can now take it out where the real fun is to be had! Here are a few basic instructions to help you get the most out of your inflatable paddle boarding experience. Lets say you have started off paddling on your right – this would make for your right hand to be placed low on the paddle shaft while your left hand is on the top of the paddle firmly clutching the grip. Keep in mind if you switch sides to reverse the position of your hands! The angled edge of the paddle should be facing away from you despite however unnatural this may seem. Lower the paddle into the water ensuring the blade is completely submerged beneath the surface. Keep your arms straight and twist at your waist as you pull the lower portion of the paddle towards you, all the while pushing the grip off in the opposing direction. Ideally your arms should be rigid and you should be using your abdominal muscles to get you going rather than you arms. Pull the paddle alongside the board back to about the placement of your ankle. In the beginning you should aim to keep all your inflatable paddle boarding strokes short and close to the board. Opposed to thinking of your paddle pulling you through the water, try to envision pulling yourself past it. Also, make note that small, gentle strokes towards the front of the inflatable paddle board will keep you going forward – if you aim to go in a straight line alternate the side of the board from which you paddle on every 4th or 5th stroke. Inflatable paddle boarding offers extreme maneuverability with great ease. There are several ways to turn a inflatable paddle board that won't require much skill or knowledge from you yet. In general it is all very simple, just paddle in the direction in which you wish to go. Right? Paddle a few strokes on the right side of your inflatable SUP. Left is where your destination lies? Just a few strokes to the left and you are on your way! A simple and effective way to reverse direction is by dragging your paddle on either side of the board, this will cause you to slow down and pivot. You can also “back paddle" by drawing your paddle in the opposite direction to assist in changing direction. A good choice for your primary steering stroke, is the “sweep-stroke" or “C" (sea) stroke as it is sometimes called - it doesn't slow you down and makes it easy maintain your paddling rhythm and momentum! Forward sweep stroke can be done when the inflatable paddle board is standing still or moving or when it is standing still. You must first take a regular forward paddling grip from the paddle. Place the blade into the water as forward as you can easily reach and keep the power face of the blade pointed away from the kayak. Keep your arms as stiff as possible while rotating your upper body in an arc that causes the paddle toe extend from the front, to the tail of the inflatable paddle board while maintain a firm hold low on the paddle. At the beginning of the stroke the front of the inflatable paddle boards is pushed away from the paddle, and at the conclusion of the stroke the stern is tail is pulled closely alongside the paddle, allowing for the inflatable paddle board to turn to the opposite side of the stroke. Try to remain aware of how where you place your weight and foot position affects your turning ability. Many people find that by bending their knees and looking over in the direction that they are turning that they have greater control navigating their inflatable paddle board. As easy as Stand Up inflatable paddle boarding is to learn, you should definitely expect to fall. This will happen throughout your learning experience, and as you refine your skills you should most certainly get accustomed to winding up in the water. For those unavoidable times that you will inevitably lose your balance, be sure to aim yourself to the side that you desire to fall. Not that you may desire this at all, but be mindful of any obstacles or debris, including the board/paddle that may wind up getting in your way and potentially causing injury. During this time you may get separated from both your paddle and inflatable SUP – if this does happen to you, remember that both pieces of equipment are designed to float and will not sink – So, with that in mind calmly swim towards your board first and use it to aid in your buoyancy, then lay atop it paddling the water with your hands to retrieve the paddle or any of your gear. Once situated, if you have yet to get back on your inflatable SUP place both hands firmly upon the deck of the board, and using a push-up like position hoist yourself up high enough so that you may place on of your knees securely on the board. While stabilizing yourself and gathering balance, stand back up and get back to enjoying your inflatable paddle board! Mistakes are a normal part of learning, and some are much more common than others. Here are a few hang-ups we have found most beginners run into when learning to use their Stand Up inflatable paddle board. 1.) Bad posture – Make sure you keep your back straight and shoulders level. You want to have your knees slightly bent as you will notice its much easier to keep your balance this way. Keep your feet parallel, about shoulders width apart. Your toes should be facing the top of the board, and the direction in which you wish to head. 2.) Nice sunset isn't it? - LOOK at the horizon, not at your feet! Many people often stare at their feet hoping it will assist in their stability. This is not the case. Be sure to keep your eyes and mind focused on the smooth ride ahead of you, not your wobbling and trembling toes! 3.) You didn't read how to hold the paddle – Again, the angled portion of the paddle – which is called the elbow – should be pointing away from you. Again, I know this seems counterintuitive, but it will make all the difference. 4.) Churning butter – This is not what we are doing, we are inflatable paddle boarding. Make sure you have your top hand clutching the grip at the top of the paddle, and both hands placed on the shaft. This will offer very little in terms of range of motion, and will not make your inflatable paddle boarding experience very enjoyable. Q: Can I use my Stand Up inflatable paddle board inflatable SUP in calm water without waves? A: Despite their apparent similarities to a conventional surfboard you by no means require waves to enjoy your inflatable SUP – Calm/Still water is actually preferable for building skill and agility while using your inflatable paddle board especially during the beginning. Q: How do I choose what size inflatable paddle board is right for me? A: Choosing a inflatable paddle board should depend on the weight and experience of the user. We at BoatsToGo.com find that for the average user, beginner especially our 12 foot SOT365T inflatable SUP is the perfect size for easily getting out and onto the water. Q: How much should a inflatable paddle board cost? A: There are a number of high quality inflatable SUP manufacturers, who offer a variety of features and products at an assortment of prices. We here at BoatsToGo.com offer our inflatable 12 foot stand up inflatable paddle board at a special price of $599 and 11' inflatable boards at even lower prices! That is half off our suggested retail price and that of comparable competitors models. With the engineering and product suport that comes with every Saturn inflatable SUP there is no reason to spend more! Q: What should I wear while I am out inflatable paddle boarding? A: Aside from a Personal Flotation Device (PFD) you can really wear whatever you are comfortable and free from restrictive movements in. Keep in mind the water temperature, and in climates where hypothermia may pose a threat we recommend you wear either a wet/dry suit to stay warm in cold weather. Q: How do I transport a inflatable paddle board with my car? 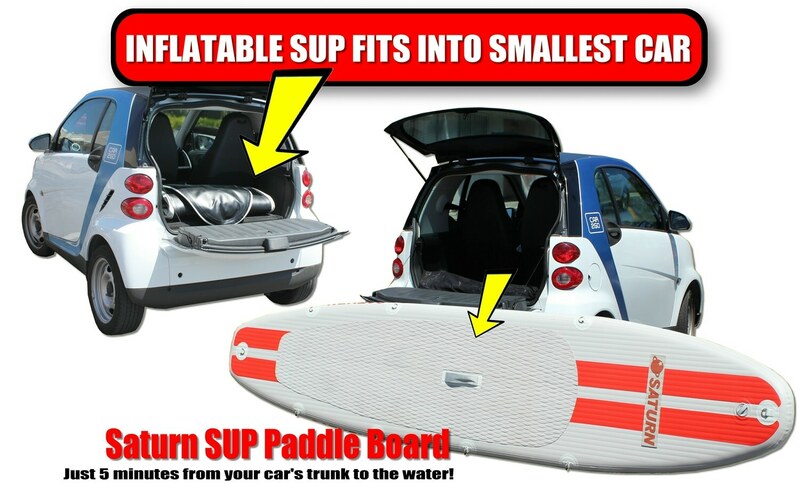 A: For your standard inflatable SUP you would most likely require a roof-rack for transport, but with the inflatable SUP from Saturn and BoatsToGo.com you can easily store your inflatable paddle board in the trunk or even on a spare seat! 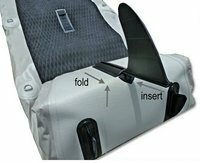 The entire 12 foot board deflates and folds up nice and compact for easy transportation and storage. Q: Are the fins on my inflatable paddle board removable/detachable? A: Although you will definitely need them while using your inflatable paddle board on the water, the fins can and should be easily detached from the inflatable SUP and stored while the board is not in use for maximum life. Q: Can I use my inflatable paddle board outside of the ocean? A: Rivers and lakes offers a much different inflatable paddle boarding experience compared to the ocean. Our inflatable paddle boards double as a ride-atop kayak so that you can enjoy using your inflatable SUP in any navigable body of water regardless of your skill level! Just affix one of our kayak seats for an enjoyable and relaxing way to end a long day of inflatable paddle boarding adventures. Q: Where about on the inflatable paddle board should I be standing? A: Ideally you would like to be about mid-way down the board – centered in between the nose/front and the tail – neither of which should be “popping out", or “digging in" to the water. Your aim is for level and uniform displacement across the surface of the water. Q: Can you surf using a stand-up inflatable paddle board? A: Although this may take some practice it can be done! Be mindful of other visitors and beachgoers – although your board is inflatable please be respectful of those enjoying the water around you! That is mostly all about getting started with paddle boarding. Happy Paddling! Saturn inflatable paddle boards are the BEST!